If the first week of April is any indication, I have the feeling that my April beauty favorites roundup video will include a lot of pink. I’ve been consistently going to my Naked 3 palette and my Maybelline The Blushed Nudes palette, so I’ve been pairing that eye look with a fairly matchy-matchy lip color. It’s surprisingly easy, long-lasting, and moisturizing—perfect for spring! 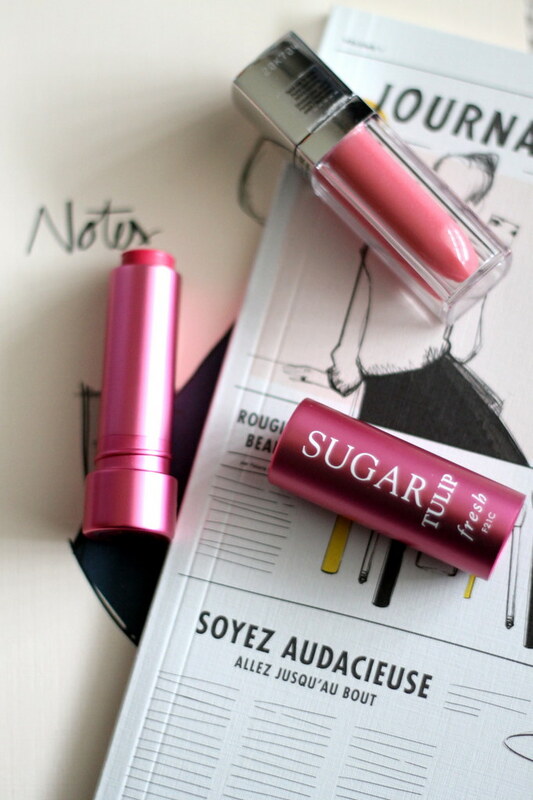 I’ve been a longtime fan of Fresh’s Sugar Lip Treatments; if you’ve never used one, they’re extremely pigmented lip balms in the prettiest colors. I picked up the Tulip color (a vibrant pink) last year and didn’t use it much, but this year is a different story. It lasts fairly long on my lips, even through an afternoon of sipping coffee, and stains my lips slightly. I like to top mine with Maybelline’s Color Elixir in Petal Plush to tone down the pink just a bit. The result is a really moisturizing, no-touchups-needed lip look that I’ve been rocking nearly every day so far this month.